Gipsy was the only boat of civil use built at the Echevarrieta and Larrinaga shipyard (Cadiz), which was eminently of military use. Colin Archer designed it with a 15 ton movement. Its construction number is the 16, following the Juan Sebastián Elcano training boat. The yacht was built for D. Horacio Echevarrieta, owner of the shipyard. After the construction of the Elcano the shipyard suffered a crisis because the government of the Republic didn’t formalize the pendent orders. The cost recorded in the archives was 80.000 “pesetas”. Once the Gipsy was finished it was shipped on a Ybarra line ship and moved to Bilbao where it remained until the sapnish civil war started. It’s a mystery how it arrived to the Mediterranean. But some records let us know that D. Miguel Sans, a well known sportive sailing man of this country and owner of the Altair during these time, skipped the yacht between the Creus and La Nao capes. Some grapeshot marks of the two times it was shot are still visible. After the end of the Civil War, the owner changed until 1951 when the Rubio-Vilar family buy it and who still owns it nowadays. 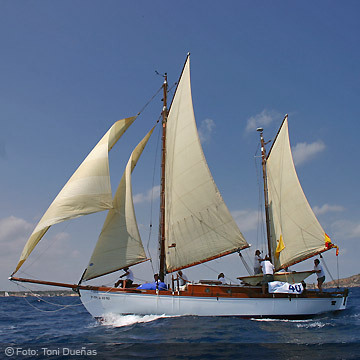 The Gipsy has raced 10 editions of the Conde de Barcelona regatta, wining the race on its class 3 times, obtaining 3 other second places and some third places.